I hope all of you had a wonderful Easter Sunday. Now that the holiday is over, it is time to get back to real life, Monday, schedules, and responsibilities. It also means that we wake up tomorrow to leftover Easter Candy. We always have Peeps left over after Easter. Mostly because I am the only one who eats them. I like to bring the packages home, cut the plastic open, and let them sit for a day or two. I like them "just stale". Fresh and soft Peeps are not my thing. These two recipes would be a great way for your family to use up some of those left over Peeps. (Perfect for Family Night Treats). In a large pot, melt your butter. Add your peeps and try not to mix too much if you are using different colors. Melt them in separate color sections within your pot. Take the pot off the heat when your marshmallows are melted. 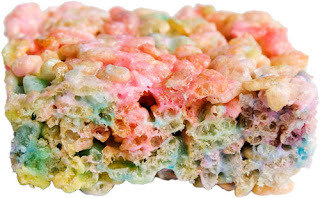 Add your Rice Krispie cereal. Stir until everything is coated. Spray a 9X13 pan with cooking spray. Butter your hands and press the mixture into the pan. Let them cool, and either cut them into squares, or use cookie cutters to cut them into fun shapes. 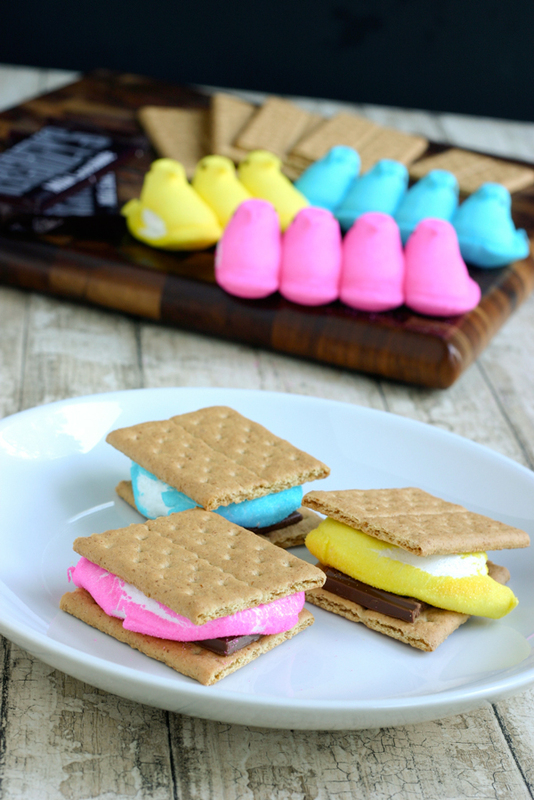 Take your Graham crackers, add a few squares of chocolate, and top it with a Peep. Microwave for 15 seconds, and eat. If you really want to have fun with these, ROAST your Peeps first, just like a marshmallow. Then add them to your chocolate and graham crackers. HOW DO YOU LIKE YOUR PEEPS, SOFT OR STALE? WHAT DO YOU DO WITH LEFTOVER EASTER CANDY? Bummer...I don't have any left over peeps, but now I hope that I come across some! My grandma always cut open the peep plastic and let them stale too... it always reminds me of her. I have to do it each Easter, just for her! As far as leftover Easter Candy... it doesn't happen often! We typically leave jelly beans out on the counter, and that never gets left over! I've seen some centerpieces made with peeps and coordinating daisies in the center (I imagine one vase inside of a larger one so peeps don't get soggy), so I may have to purchase an extra package or two this year to give that a try! But I LOVE the peep rice krispie treats. Very pretty! What the heck is it with STALE PEEPS.. I always liked them that way even as a child.. glad to know it wasn't just me.. LOL Love the idea not sure if there will be any leftovers though..ha. Love them PEEPS!! I thought that was the only way to eat them?? ?